It’s hard not to dream big among the tall mountains and wild sea in Southeast Alaska – especially in Haines where Christy Tengs serves dreamers and misfits alike in her family’s downtown institution, the Pioneer Bar and Bamboo Room. Even she has a dream – to meet the famous person who has inspired her and propelled her to become a star in her hometown. Haines local Christy Tengs takes her talents to the stage in hopes of meeting Dr. Phil McGraw one day. Christy Tengs hopes one day to meet Dr. Phil McGraw, the talk show host. But why she wants to meeting and the journey of how’s she’s trying to achieve that is becoming a bigger story than the dream itself. First a little background; Tengs grew up here in this bar and restaurant her parents operated – The Bamboo Room. She had a loving family and good friends, but also an alcoholic father and some hard scrabble times. Tengs says she always had a way with words and songwriting. When she was 27 she got the chance to go to the Berklee College of Music in Boston. After graduation, Tengs went to Nashville. She had an offer to work with CBS staff songs writers. But her dad called her home to Haines. But she kept writing. She’s known for penning poems for special friends and events in Haines. Several years ago, Tengs found a new inspiration for her prose. The Dr. Phil show would be playing on the TV as she readied the bar to open each day. His one-liners and motivational talk sounded like natural song hooks. She decided she wanted to seek Dr. Phil out and have him hear her songs. She travelled back to Nashville and cut a demo with 21 songs. Then she went to Los Angeles. She got her CD into the hands of people associated with Dr. Phil. But, she’s never heard from him. 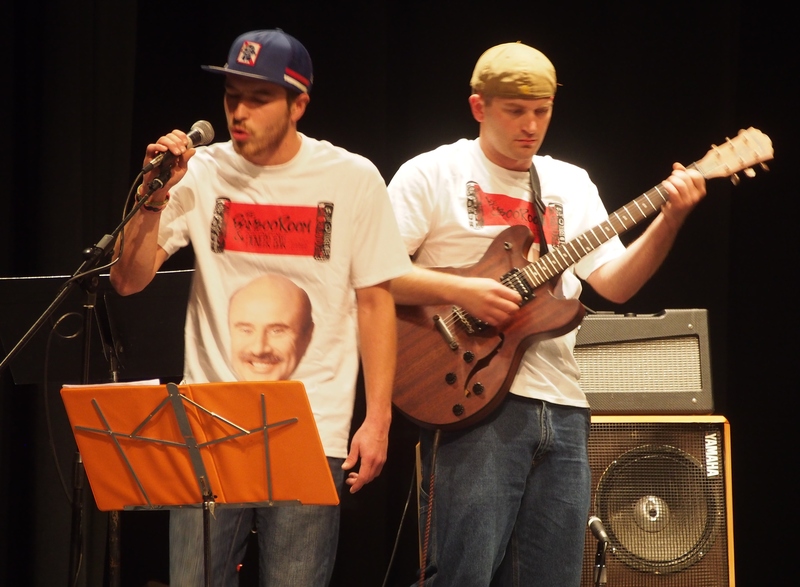 Decked out in T-shirts with Dr. Phil’s face on them, the Haines band Perpetual Beer Run performed one of Tengs’ songs. 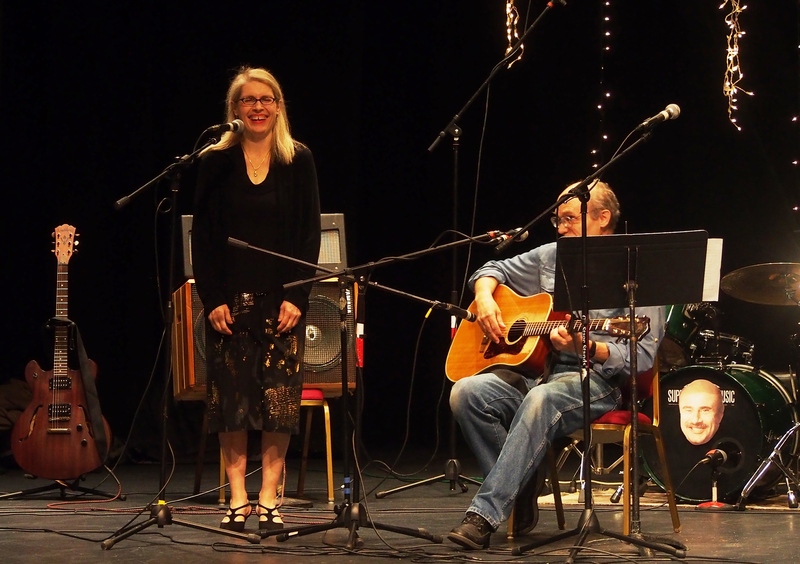 Her story did catch the eye of Seattle filmmakers who have been chronically Teng’s story for a documentary called “Above the Bamboo Room.” As part of film, they organized a recent concern in Haines to showcase Teng’s Dr. Phil’s songs as performed by local musicians. The show drew a crowd of about 400 people and it received rave reviews. Tengs says she hadn’t even heard some of the songs performed before. And if you didn’t know the premise, you probably wouldn’t have noticed that Dr. Phil one-liners were hidden in the songs. Like this one written about Dr. Phil’s advice to “Rise Above Your Raisin.’” Decked out in T-shirts with Dr. Phil’s face on them the Haines band Perpetual Beer Run performed that song. At the end of the evening, the filmmakers asked the crowd to hold up signs in the audience and recorded a scene for the documentary trying again to catch Dr. Phil’s attention. No one knows if the film will finally attract the attention of Dr. Phil. But the concert certainly attracted the attention of the community and inspired Tengs even more. Some friends had heard of Tengs off-beat dream, but she said she kept it pretty quiet, worried it sounded too crazy for her to be taken seriously. But it was Teng’s talent as a songwriter that really got people’s attention. Her longtime friend Debra Schnabel says she knew all along Tengs was exceptionally talented.